While variations abound, a traditional cobbler is a baked, deep-dish fruit dessert that's topped with a biscuit sprinkled with sugar to give it a bit of crunch and color. Skinless chicken is the basis of this delicious stew with cornmeal dumplings made with low-fat milk. As delicious as it is nutritious, this quick and easy hearty low-fat vegetable soup hits the spot in cold fall and winter months! This is a makeover of Cracker Barrel's Chicken & Dumplings. My aunt had created the original recipe which called for 1.75 lb chicken and whole milk. It was always one of my families favorite dinners that I made once in a while on special Sundays. Recently, I decided to try a healthier version of it with lower calories, cholesterol & sodium to see if it would pass the "family test". It did! They couldn't tell the difference. The healthy version of this recipe went down 76 calories, 31mg cholosterol & 1104 mg of sodium per serving. On a side note, I know some people who use prepackaged biscuit dough to make their dumplings to make it easier but I don't like the taste of the perservatives because it makes the whole recipe taste like it came out of can. There is nothing like homemade! 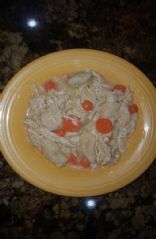 Quick and comparitively healthy - I use reduced fat bisquick for the dumplings. Awesomely good and filling - a good comfort food fix with a lot of protein. Usually made with whipping cream and served with dumplings, this creamy chicken is made less fattening by using milk and serving over your favorite pasta. I serve with egg noodles. A family favorite and a lower fat version of my mother-in-law's Saskatchewan recipie!Submitted by: CALGER! Removing the chicken fat and skin and adding no salt to the tasty sauce makes this chicken favorite heart-healthy.